The proponents of the Trans-Pacific Partnership (TPP) are doing everything they can to try to push their case as they prepare for the fast-track vote before Congress this month. Today, Roger Altman, a Wall Street investment banker and former Clinton administration Treasury official weighed with a NYT column, co-authored by Richard Haass, the President of the Council on Foreign Relations. Of course if China became a party to the TPP the United States would still not have a bilateral trade agreement with China. (That’s right, the TPP is a multilateral trade agreement, not a bilateral trade agreement.) This indicates the level of silliness to which TPP proponents must turn to push their case. As a practical matter, a trade agreement, the WTO, was enormously important in the increase in China’s exports to the United States. China joined the WTO at the end of 2001, three years later the U.S. trade deficit with China had nearly doubled from $83 billion to $162 billion. It is simply not true that “there is nothing new in the TPP that would affect existing dispute-resolution mechanisms.” Of course we don’t have the final text, but based on past agreements like NAFTA, foreign investors would be able to contest a wide range of labor and environmental issues in the investor-state dispute settlement tribunals established by the TPP. For example, if New York State wants to restrict fracking, a foreign gas or oil company could contest the ban in an investor-state tribunal. If Altman and Haass have information indicating that this is not true, they do not disclose it in the column. As far as the impact of the TPP on drug prices, the leaked intellectual propertychapter indicates several extension of patent and related monopoly protections that would be expected to raise prices. Of course it is not “certain” that the effect will be to raise drug prices, just as it is not certain that shooting someone at close range will lead to their death. Altman and Haass actually don’t dispute that this is true, they just tell us the criticism is short-sighted. Their argument is that we are too dumb to tell the difference between expansionary monetary policy (which will typically lead to a lower value for a currency) and a deliberate effort to lower the value of a currency by selling large amounts in international currency markets and buying up foreign currencies. That one doesn’t seem too hard to distinguish to me and other economists (e.g. Fred Bergsten, the former president of the Peterson Institute for International Economics). I’m sorry that Altman and Haass find it so complicated. Perhaps they should turn to another line of work. Their response that this should be taken up at the I.M.F. is another sign of the contempt they have for the general public. The United States has never raised a currency case with the I.M.F. in its almost 70 years of existence. How is that most of us will benefit from Pfizer, Disney, and Microsoft getting more money from Asian and Latin American countries for their patents and copyrights? Those who own lots of stock in these companies obviously benefit, but for the rest of us there is no obvious case. The higher payments to Disney and Microsoft will crowd out other U.S. exports. Maybe the NYT should give Altman and Haass another column to try to explain their argument here. Finally, the bromide that “free trade leads to greater overall prosperity,” is not relevant here. The TPP is about increasing protection in the form of stronger and longer patent and copyright protection. If we were talking about reducing the barriers to trade in the services of physicians and other highly paid professionals and reducing patent and copyright protection, then we could be singing the merits of free trade with the TPP. 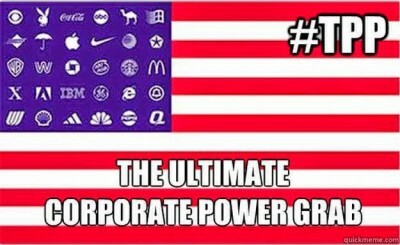 But the TPP is about corporate profits, not free trade.